2018 With Stuart Moore: 'Framing memory: return to the zone' [chapter/conference proceedings] in Costa Valenta A. (ed.) AVANCA | CINEMA 2018. Avanca: Edições Cine-Club de Avanca. ISSN: 2184-0520. Publication date: 25 July 2018. pp. 103-108. 2017 With Stuart Moore: ‘On Location: landscape cinema and digital memory’ [chapter/conference proceedings] in Costa Valenta A., and Capucho R. (eds.) AVANCA | CINEMA 2017. Avanca: Edições Cine-Club de Avanca. ISSN: 2184-0520. Publication date: 26 July 2017. pp. 251-255. 2017 With Roberta Mock and Ruth Way ‘Heaven is a Place: The politics and poetics of LGBT location in a community dance film’ [chapter] in Sarita Malik, Caroline Chapain and Roberta Comunian (eds.) Community Filmmaking: Diversity, Practices and Places. London: Routledge. The chapter draws upon a range of scholarly disciplines (including performance studies, film studies, somatics, queer studies, urban studies and human geography) from the perspective of artist-researchers in order to reflect upon the implications and potentials of a community filmmaking practice that is simultaneously aesthetic, political, spatial and social. By focusing on a movement-based performance for and through digital video, it considers how the process-driven triangulation of thinking bodies, sexual subjectivities and emplacement within such a practice might enable us to acknowledge, consolidate and reimagine a community that had been either erased or marginalized in dominant accounts of its city. ISBN: 978-1-138-18806-8. Publication date: 24 April 2017. pp. 191-209. 2016 With Stuart Moore: ‘Filming the river: memories of the tidal Tamar’ [chapter/conference proceedings] in Costa Valenta A., and Capucho R. (eds.) AVANCA | CINEMA 2016. Avanca: Edições Cine-Club de Avanca. ISBN: 978-989-96858-8-8. Publication date: 1 September 2016. pp. 140-144. "In Chapter 5, 'Moving Image Production and the Pedagogical Development of Media Literacy,' Liam French, Stuart Moore and Kayla Parker reflect through an experiential learning case study on the extent to which the involvement of young people in filmmaking develops their critical thinking abilities and personal and social development, in addition to fostering such transferable skills as reasoning, meaning negotiation and problem solving. The results of the discussion relevant to various Enquiry-Based-Learning pedagogies also make it quite clear that much could be borrowed from such projects to reach others through curricula that value media literacy, not in the traditional sense of critical reading of media texts, but rather through involving learners in the making of media products and artefacts" (Bahloul, 2012: 7). 2018 'Father-land' [with Stuart Moore, text and stills; for exhibition at Nicosia Municipal Arts Centre, 19 October 2018 to 12 January 2019] in Liz Wells (ed.) Layers of Visibility: NiMAC/University of Plymouth Artist Residencies 2013-2017 [exhibition catalogue]. Plymouth: University of Plymouth Press. pp. 79 to 90, and cover image. 2018 With Stuart Moore 'Father-land: troubled dialogues in a divided island' in Arts Institute Research Stories 2016/17 [brochure] Plymouth: University of Plymouth. pp. 17-18. Pdf available here. 2016 'Not playing ball: Steven Paige’s Let’s Go Bowling' [essay on printed broadsheet for artist’s film exhibition in the cinema at Plymouth Arts Centre, 5 to 14 April 2016], Gallery in the Cinema programme. Plymouth: Plymouth Arts Centre and Moving Image Arts. Let’s Go Bowling by Steven Paige launches the Gallery in the Cinema, an initiative of Plymouth Arts Centre and the Moving Image Arts (MIA) Research at Plymouth University, which presents a regular programme of artists' moving image exhibition in the Centre’s cinema accompanied by a strand of written essays in order to create a critical landscape for understanding contemporary artists’ moving image practice. Critical Contemporary Culture is an online journal that envisions an alternative cultural-intellectual public space. CCC is a conversational space, a democratising porthole, attempting to work against the restrictions of the market towards innovation, creativity and intellectual freedom. CCC brings together work in the humanities, social sciences, arts and cultural practice. It works towards providing an autonomous space. 2014 'Blobs in tartan colours: Margaret Tait’s Painted Eightsome' [essay] Frames Cinema Journal Issue 5 'Framing animation'. 1 November 2014. Fife: University of St Andrews. ISSN 2053-8812. 2012 'Making Glass' [video essay, and video art], with Stuart Moore, in Annette Arlander, Yvon Bonenfant and Mary Agnes Covey-Krell (editor-curators). 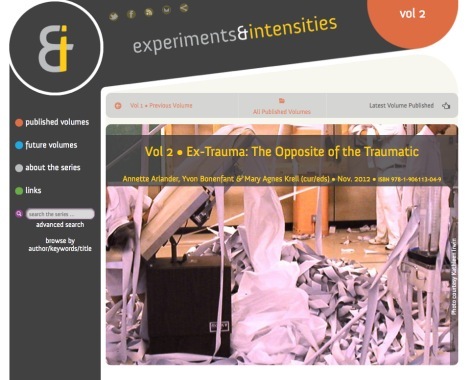 Ex-Trauma: The Opposite of the Traumatic, Experiments and Intensities series Volume 2, November 2012. Winchester: University of Winchester Press. ISBN 978-1-906113-04-9. 2011 'White Body: animating feminine pleasure' [essay, with film and film frame] in Body, Space and Technology Journal Volume 10. Number 2. Summer 2011 [print and online]. Brunel University, West London. ISSN 1470-9120. 2011 'White Body' [film, with research statement and peer reviews] in Charlotte Crofts (ed.) JMP Screenworks Volume 2. AVPhD Issue. Summer 2011. 2010 'Art of research' [feature essay and interview with Dr Roberta Mock] in Lee Morgan (ed.) ArtsCulture Plymouth Issue 3. June 2010 [print and online]. Exeter: News and Media Republic. pp. 26-30. 2010 'Memories wanted' [essay, with film and colour photographic series] in Nicholas Rombes (ed. and convenor) REQUIEM // 102. Minute #29 16 December 2010. 2002 'Icon: A Light at the End of the World' [feature essay] in Imagine: Animation/digital media/post production Spring 2002. Bristol: Greetlake. pp. 59-60. 2001 'Remembering Alison de Vere (1927-2001)' [feature essay and obituary] in ASIFA News Volume 14. Number 1. 2001. Ottawa: International Association of Animated Film. p. 16 [French translation p. 17; Russian translation p. 18]. 2000 'Direct-it-Yourself guide to film-making’; ‘Face to Face: with Alison de Vere’; and ‘Mr Entertainment: Colin Rose’ [x 3 feature essays] in Bel Mooney (ed.) Proof: Year of the Artist in the South West Summer 2000. Exeter: South West Arts. ISSN 1470-5508 pp. 21; 22-23; 24-25. 1998 'Sunset Strip' [double-page feature, extracts from production diary, with enlarged colour film stills, front and back covers] in Vicky Smith (ed.) Boiling; experimental animation Issue 1. October 1998. London: London Film Makers’ Co-op [no page numbers]. 2014 ‘PoetryFilm Archive: Unknown Woman by Kayla Parker’ [colour film still with text] Zata Kitowski, PoetryFilm (19 August 2014). 2012 ‘Kayla Parker: Sunset Strip’ [text and biog, with enlarged film frame, exhibition catalogue for continuous screenings 31 May to 26 August 2012, Canary Wharf Station] in Canary Wharf Screen - Season 2: Animate Projects’ Move on Up [16 selected films]. London: Art on the Underground. p. 7. Sequences of Sunset Strip 35mm film frames also printed on promotional merch, including postcards and cloth shoulder bags. 2012 ‘Teign Spirit’ [large colour still, Coastcards section], and ‘Sunset Strip’ [large colour still 35mm artwork, penultimate page] with quotation from Kayla Parker, in Animate Projects: experiments in animation [brochure]. London: Animate Projects. 2011 ‘White Body’ [film and artist’s statement] in HerStory (July 2011) [DVD of exhibition, 8 June to 8 July 2011, Link Gallery, University of Winchester] Winchester: Women’s Work. 2010 ‘Sunset Strip’ [35mm film] in AnimateTV: 20 years of experimental animation from the UK [DVD of 23 selected films, with booklet]. London: Animate Projects. 2008 ‘The Brothers Quay in Conversation with Suzanne Buchan’ [drawings and text, x 4 Field Notes notebook pages] Proof magazine, Kate Jago (ed.) (Volume 3, Issue 1, Spring 2008) Exeter: Portfolio Five. p. 20. 2008 Spectacular visions [programme notes for three screenings on successive evenings, Jill Craigie Cinema, Plymouth] British Animation Awards 2008: Public Choice Awards. Plymouth: Peninsula Arts. 2007-2008 Art of Conversation [website, online creative higher education media research project]. Plymouth: Sundog Media. 2006-2010 Unity [website, cultural diversity and BME achievement project Unity]. Plymouth: Plymouth College of Art and Design. 2006 ‘Sunset Strip’ [x 9 colour film stills, inside back cover] Benjamin Cook and Gary Thomas (eds.) The animate! book: rethinking animation. London: LUX and Arts Council England. ISBN 0-9548569-2-9. 2006 ‘Cage of Flame’ and ‘Project’ [large colour film stills] in ‘Images’ chapter Jackie Hatfield (ed.) Experimental film and video: a new anthology. Eastleigh: John Libbey. ISBN 0-86196-664-3 p. 275. 2006 ‘The bigger picture: Getting animated’ [reflection on Disney’s Snow White and the Seven Dwarfs] in Simon Cropper (ed.) Time Out 1000 films to change your life. London: Ebury. ISBN 978-1-904978-73-2 p. 101. 2005 Street Rat [website, online film production site] First Light. Plymouth: Sundog Media. 2005 Learning companion (two reprints, 2006) [comprehensive study guide for level 3 learners, x 64 pages]. Plymouth: Plymouth Learning and Work Partnership, and the 14-19 Pathfinder Project [author and co-designer; production: Sundog Media]. 2004 Wild Ideas: a Perfect World [website, online film production site] Wild Ideas, Bristol Natural History Consortium. Plymouth: Sundog Media. 2004 ‘Project’ in Memory, Narrative, Imaging the un-see-able programme; and ‘As Yet Unseen’, ‘Walking Out’ and ‘Elemental’ in Cinema, spectacle, immersion programme [exhibition catalogue, enlarged film stills], in Jackie Hatfield and Stephen Littman (eds. and curators) Experiments in moving image [exhibition 26 January - 1 February 2004, University of Westminster] Margate: Thanet. ISBN 1-902458-06-0 pp. 49; 90; 91; 92; 100; 105. 2003 ‘Metamorphosis’ [16mm filmstrip], ‘Sunset Strip’, ‘Walking Out’ and ‘Running Horse’ [enlarged colour frames] in Drawing on film section; ‘Cage of Flame’ [large colour film still: Woman in Smoke] in Themes: didactic section, in Richard Taylor The encyclopaedia of animation techniques (revised edition; original edition, 1996). London: Quarto ISBN 0-240-51488-2 pp. 64-65; 131. ‘Walking Out’ film frame also included on front cover of dust jacket. 2003 ‘Sunset Strip’ [film and production notes, with b/w studio photograph] in Louise Spraggon Into animation: a video compilation and teaching guide [VHS and CD-ROM, with booklet]. London: BFI Education. ISBN 1-903786-10-X. 2001 ‘Physic’ [digital film] in Dartmoor Lives and Landscapes [VHS and DVD]. Princetown: Aune Head Arts. 2000 You Are Here [website, online poetryfilm project documentation] Miniature Film Project, Poetry International and Royal Mail. Plymouth: Sundog Media. 1997 Project [blogsite, online film production diary] One Minute Film, London Film Makers’ Co-op. Plymouth: Sundog Media. 1996 ‘Cage of Flame’ [enlarged film still, photo credit: Stuart Moore] the cover image; with bio/filmography in ‘Kayla Parker’ double-page, in David Curtis (ed.) A directory of British film and video artists. Luton: John Libbey and Arts Council of England ISBN 1-86020-003-6 pp. 138-139; 223. 1996 ‘As Yet Unseen’ [enlarged film still, the cover image, exhibition programme] (July to September 1996). London: London Film-makers’ Co-op. 1994 ‘Kayla Parker’ [exhibition catalogue, double-page spread with large b/w photograph] in Brion Clinkingbeard (ed. and curator) Strandline: where Plymouth meets the sea [exhibition 23 April to 11 June 1994, Plymouth City Art Gallery] Plymouth: Plymouth City Museum and Art Gallery. 1993 ‘Unknown Woman' [x 2 colour 16mm film frames] in Ilona Halberstadt (ed.) PIX 1. ISSN 0967 8727. 1992 ‘Unknown Woman’ [colour enlarged film still], and ‘A-Z: Parker, Kayla GB’ [bio/filmography] in Jayne Pilling (ed.) Women and animation: a compendium. London: British Film Institute. ISBN 0-85170-377-1 pp. 80-81; pp. 133-134.